There is a fine line between success and failure in any business. Just one false step can set your business on the wrong course and completely change everything. Fortunately, in the world of real estate you control the direction of your business and the decisions you make. By aligning yourself with good people and constantly thinking about the big picture you will give yourself the best possible chance of success. Where others will think your success is based on luck or circumstance you know that is not the case. Here are five areas in your business that can ultimately make or break your success. Patience. Real estate investing is very similar to playing in a poker tournament. Anyone who has ever sat through a large multi-player tournament knows that there are long stretches of monotony followed by moments of intense action. In real estate, like poker, those who can stay patient and not force the action are the ones that will be most successful. Regardless of whether you are working on multiple deals or haven’t had a closing in months you need to follow the same process and due diligence. It is no hyperbole to say that getting involved in just one bad property can negatively effect your portfolio. Instead of staying true to your core numbers and guidelines you will look for opportunities that aren’t really there. What inevitably happens is that once you are involved a bad deal a better one will come your way that you have to pass one. Where you could have made a strong net profit you are forced to scratch out whatever you can get, or worse. Staying patient in finding deals is never easy but it is an essential part in running a solid business. Relationship building. Real estate investing is the ultimate contact sport. The more contacts you make the better your chances of finding deals. Regardless of how strong your business currently is you should do something every day to build your network. Finding deals from the MLS or traditional sellers may not be enough to sustain your pipeline. On the flip side, there are always leads from people you may have previously worked with or people in your networking circles. These leads are often easier to navigate and ultimately easier to close. Once you gain the trust of someone in your network your relationship strengthens and more opportunities open up. Your network will tout you or your services to someone they know and without even realizing it you will have eliminate the chances of gaps between deals. Every deal you are involved in and conversation you have is an opportunity to build your brand and improve a relationship. Take calculated risks. There is no such thing as a perfect deal. Every deal, every property and every new relationship carries at least some level of risk. With each opportunity that presents itself you need to weigh the risk against the reward. You have to acknowledge the downside but not be consumed by it. Sure, you can get in a car accident every time you drive but it doesn’t mean you won’t ever get in a car again. The same is the case with investing in real estate. You may come across the occasional lemon but it doesn’t mean you will never make another offer. All you can do is make sure you are prepared for whatever you encounter. Take the time to look at every property on a case by case basis and make your decision from there. Understand the downside but also allow yourself to look at the upside. Unless you totally botch something with your due diligence any oversight you make will not be catastrophic. You may not make the profit you desire, but you wont take three steps backwards. The best investors know when to put themselves out there and take calculated gambles. Focus on bottom line. There are times when it is easy to remember that you are running a business. As obvious as it may be your goal should be to always focus on your bottom line. You are not in the business of acquiring real estate simply to add to your portfolio. Any addition you make should be done with the thought of making money. If the deal doesn’t make sense financially you should pass. This is the case with every decision you make regardless if you are looking at marketing, networking or team building. Not every deal is going to be a home run but if it doesn’t make sense financially you should give it a second thought. Right partnerships. You are only as good as the people around you. 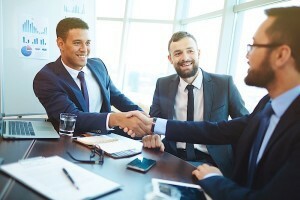 The right partnerships can truly make or break your business. Prior to diving into a partnership you need to make sure you know what you are getting into. A partner should enhance your business and open up new avenues of growth. It should allow you to earn income in areas you may not previously have thought of and let you focus on additional areas of your business. It shouldn’t be a burden and you shouldn’t have any concerns regarding trust. If the communication isn’t what you want you need to reconsider the arrangement. A bad partnership will stop your business in it’s tracks and make running your business a nightmare. There is plenty to focus on when running a business. Instead of getting pulled in every direction focus on these five areas that can make or break your success.